A rhinoplasty, or nose job, is a popular surgical procedure that can significantly change a person’s face. When a person decides to have a rhinoplasty for the first time, it is known as a primary rhinoplasty. However, the results of a primary rhinoplasty may not always go as planned or meet the patient’s expectations. This usually leads a patient to have further surgical procedures done to correct their nose, which is known as a revision rhinoplasty. Here are the top reasons why a person may seek a revision rhinoplasty. Choosing a credible plastic surgeon is crucial when considering a rhinoplasty for the first time. A surgeon who is not board-certified or, more specifically, not a board-certified facial plastic surgeon, may not always have the expertise to perform a successful rhinoplasty. In addition to receiving in-depth training, a facial plastic surgeon with a track record of successful rhinoplasty procedures will be able to provide a patient with desirable results. It is important for patients to choose surgeons that commonly perform and have a passion for rhinoplasty surgery. By doing adequate research and choosing the right surgeon, patients can avoid incorrect rhinoplasties that may require further revisions in the future. Some people seek a rhinoplasty to resolve a medical or breathing problem, while others are interested in the procedure for purely aesthetic reasons. If a primary rhinoplasty does not go well, whether for medical or cosmetic reasons, it can cause a person to experience difficulties with their breathing. Altering the original structure of the nose can be quite complex and can create obstruction to the nasal airways if the procedure is not done correctly. The most common areas that cause nasal obstruction are: the septum, the turbinate, and the nasal valves. A revision rhinoplasty is carried out to resolve such obstruction and improve breathing. In some cases, however, breathing problems may be temporary and simply part of the healing process. Even the most experienced and precise surgeons can find their patients experiencing some breathing problems as the nose begins to heal from scarring. Often times, this obstruction will resolve on its own once the nasal passage has fully healed and the swelling has subsided. If breathing difficulties persist, however, a revision rhinoplasty may be the solution to identify and correct the primary procedure. Rhinoplasty procedures for aesthetic reasons are commonly done to give the nose a wider or thinner appearance. After the initial procedure, however, the patient may not be fully satisfied with the outcome. This could be due to unrealistic expectations from the patient, a miscommunication between the surgeon and the patient, or unexpected results due to healing after surgery. A few of the most common complaints from patients seeking revision rhinoplasty include having the appearance of a “pig nose”, a nasal hump, poor scars, nasal asymmetry or an unnatural nasal tip. A patient who is not satisfied with the results of their primary rhinoplasty is likely to continue feeling unhappy with their appearance, causing low self-esteem. A revision rhinoplasty with an experienced, board-certified facial plastic surgeon, can be carried out to help patients get closer to their ideal result. While a plastic surgeon may have employed implants or cartilage grafts during the course of a rhinoplasty, improper usage or poor planning may result in issues with how these implants appear in the nose after the primary surgery. Displaced implants may cause the nose to appear round, crooked or bulbous. In this case, a revision rhinoplasty is done to move implants or grafts to their proper positions. They can also be replaced entirely depending on what is deemed best by the surgeon. A revision rhinoplasty will result in a more refined nose that the patient desired in the first place. The ideal outcome of any rhinoplasty is to achieve natural looking results that enhance the patient’s appearance and highlight other features of the face. Performing a revision rhinoplasty is more challenging and specific because the surgeon is looking to correct the initial procedure, rebuild what has already been altered, and accomplish what the patient was hoping to achieve in the first place. It is important to choose a surgeon who has received extensive training and is specifically skilled in performing revision rhinoplasty procedures. An experienced facial plastic surgeon is an ideal choice when seeking a revision rhinoplasty as they focus solely on face and neck procedures. There are also many resources available to patients to assist in selecting the right surgeon. Popular platforms such as RealSelf and HealthGrades allow patients to read reviews about different surgeons in their area. One of the most important things to consider, in addition to a surgeon’s credentials and skills, is how open the line of communication is between patient and surgeon. During the consultation, both patient and surgeon should be open about specific goals and expectations with a revision rhinoplasty. Transparency and honest communication is key to achieving great results, especially after the primary procedure did not go as planned. By choosing a surgeon who has proper credentials and good communication skills, a patient can expect the revision rhinoplasty to result in a more aesthetically pleasing nose. Imaging morphing can be an invaluable tool to help the doctor and the patient communicate about the goal outcome of a revision rhinoplasty. Dr. Jonathan Kulbersh is a double board-certified facial plastic surgeon located in Charlotte, North Carolina. He received training with top plastic surgeon in Beverly Hills, Dr. Paul Nassif of Botched, and has extensive experience with revision rhinoplasty. 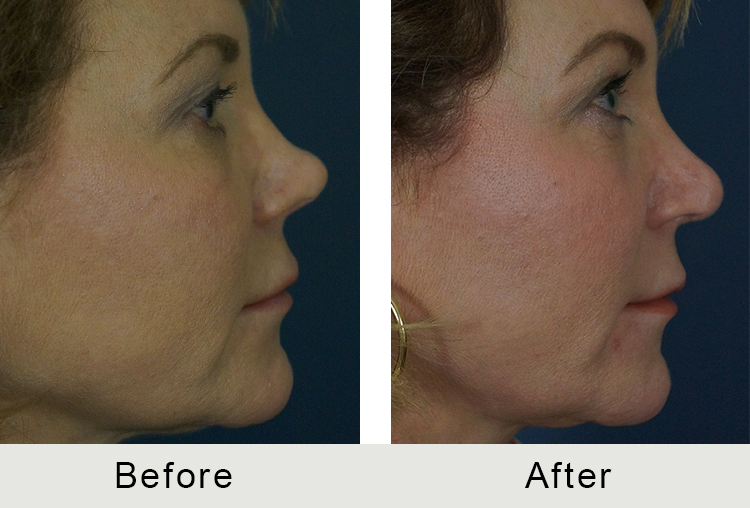 To learn more about a revision rhinoplasty, please schedule a consultation by calling Carolina Facial Plastics at (704) 842-3644 or by completing the online request form. Next, read Am I a Good Candidate for Blepharoplasty.